It feels like spring is starting to agitate in its loins (as Keats would say). It also feels like I need to show my bike a little TLC after it has spent the winter doing a ‘good job of work’. And as every beautician will know, performing some serious TLC requires a serious torque wrench. Whilst I’ve been washing off my bike after most rides, and a couple of weeks ago, I gave the whole drivetrain a (relatively) deep clean, I’m thinking that it might be time to start taking key components off the bike in order to clean (and grease) them properly. I want my summer cycling to hum to the tune of sweetly-tuned gears. This is another of those ‘research before buying one’ posts. I’ve always known (in my heart of hearts?) what a torque wrench does (it tightens stuff to a precise amount of, er, tightness). But until now I’ve never had cause to use one. Having decided to buy one, I’ve been doing some research and in this post I’ll share it with you (in case you, too, wish to tighten things to precise levels of tightness). The other reason I’ve decided to buy a torque wrench follows a recent trip to my local bike workshop (The Cycle Hub in Ashbourne) and a cycling ‘horror story’ that I heard therein. Up on the bike stand was a beautiful celeste green Bianchi road bike. The issue was that mechanic Mark (the owner of The Cycle Hub) couldn’t get the bottom bracket out of the frame in order to service it. Campagnolo bottom brackets are notoriously more difficult to get out (versus, say, Shimano). He’d tried the bike-specification bottom-bracket-pully-outy-thingy. Wouldn’t budge. The bottom bracket had seized solid within the frame. Then he purchased a car-strength-pully-outy-thingy. No dice. The steel pincer arms were bending before the BB was moving. Then he stopped. Applying more forced risked damaging the carbon frame. It is pretty much a certainty that this expensive carbon frame now has a bottom bracket permanently fused within it. The owner of the bike will just have to ride it until the bearings down there either perish or seize up through a lack of grease. Mark put the cause of the problem down to, firstly, the bottom bracket not having been serviced since the bike was bought, two well-ridden winters of cycling ago and, secondly, that the bottom bracket may have been over-tightened in the first place. And then I decided to buy a torque wrench. In America (and Canada), ‘wrench’ is the general term for tools that have longer handles in order to help you apply more force when tightening or untightening, say, a nut or a bolt. In the UK, a large section of this wrench universe we’d know as a spanner. For those with an insatiable desire for more information on wrenches and spanners, can I point you to this new website I’ve found, which seems to offer a viable alternative to Microsoft Encarta. Fine, So What Is A ‘Torque’ Wrench? Handily, as the table in the Wikipedia article above makes clear, a torque wrench is a torque wrench wherever you may English-speakingly reside. It’s a type of wrench (or spanner) where you set the amount of torque you wish to apply when tightening a given bolt. Once you’ve set the wrench to your desired amount of torque, it should tighten your bolt of choice up to that level and no more. In short, it’s a tool for precision tightening. 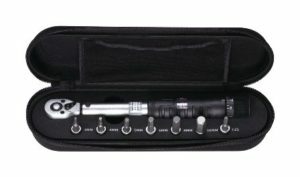 Do You Need A Bike-Specific Torque Wrench? It’s important to get a bike-specific one because most general (car) ones don’t go down to a low enough torque setting for certain ‘use cases’ on your bike. 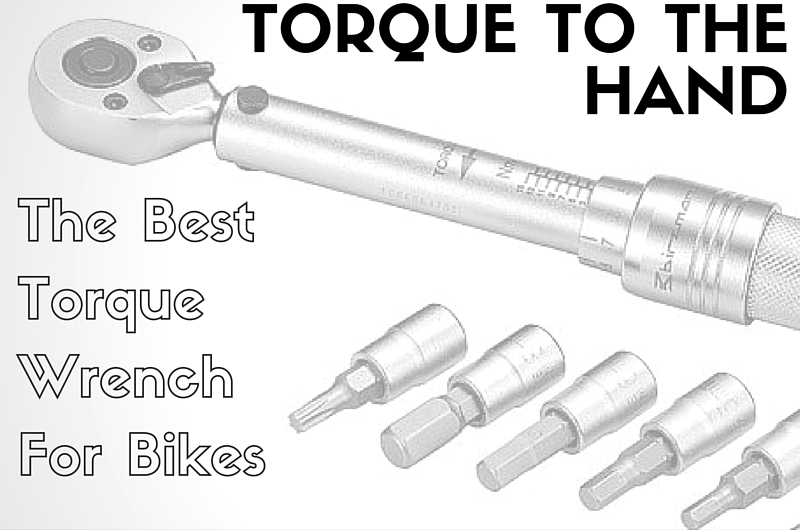 A bike torque wrench will go down to 2Nm whereas many car ones won’t go below 25Nm. Those low force settings are for tightening more delicate components such as carbon seat posts, where you may be looking to tighten to a point that’s not a great deal more than ‘finger tight’. Apparently 5Nm is a common setting on bike, being used for bolts that hold in place stems, handlebars and faceplates (whatever they are…). 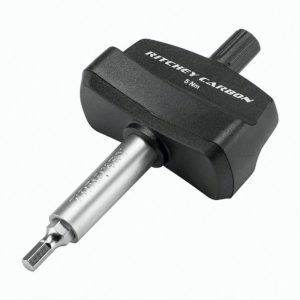 According to Mark, our trusty Ashbourne-based mechanic, a carbon seatpost, having had a carbon friction compound applied to help prevent slippage, won’t need much more than 2Nm of torque in order to hold it in place. 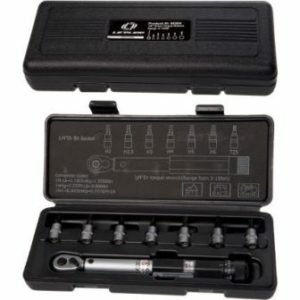 Also, a bike-specific torque wrench will generally be sold with the appropriate Allen key (or hex key) heads (or sockets as they seem to be called) for use on a bike. According to this handy reference guide of bike torque specifications, the range of potential ‘tightnesses’ for components on bike goes up to 50 Nm. The lowest torque setting shown is 5Nm (and Mechanic Mark uses even lower for some jobs). Big Torque Wrench vs Little Torque Wrench? This video from GCN handily demonstrates the use of both a ‘big’ torque wrench and a ‘small’ one (and coincidentally just happens to show the removal and regreasing of a Shimano bottom bracket). The video shows the larger torque wrench being used to tighten up the bottom bracket bearing cups once they’d been put back in. You’d also use a big torque wrench to tighten the lock ring that holds the rear cassette in place (though I must admit, in my limited experience, I’ve tightened this one by ‘feel’ before). The ‘small’ torque wrench shows up right at the end of the video, when the cranks are being reattached. It strikes me that there are far more bolts and fittings on the bike that need a lower torque setting, than need mo’ tightness. So if, like me, you’re only in the market for purchasing one torque wrench for the time being, I’d suggest that a ‘small’ torque wrench would take wallet priority. That said, if every bolt on your bike needs tightening to exactly the same level of torque, then madam (or sir) might like to consider a torque key. 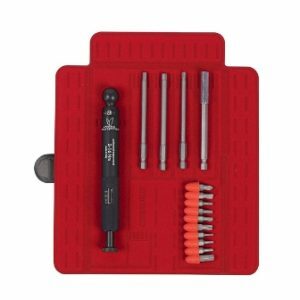 With a torque wrench, you have the flexibility to attach a variety of Allen/Hex key heads, or other attachments specific to the job at hand. You can adjust to a range of torque settings to suit your desired level of tightness (as a penny-conscious Yorkshireman, my level of tightness is set very high indeed). A torque key eschews this flexibility in favour of being pre-set to a stated torque level. So, upon making the miraculous discovery that every bolt on your bike needs tightening to 5Nm, you’d buy a torque key set to exactly that. Both of my grandfathers boast a certain proficiency with tools amongst their palmares. My paternal one was a joiner; my maternal grandad was a fitter in the Middlesbrough ship yards. Sadly neither is still around to proffer advice on how to get the best out of a torque wrench. So I had to use the Internets as a kind of techno-grandad. Don’t use your torque wrench to undo stuff (despite the fact that I’m sure the GCN video shows them using one to remove the bottom bracket…) – apparently this can ruin the calibration on the wrench. Don’t put blind faith in a torque wrench. You still need to use common sense. If it feels like you’re over-tightening something, then you might well be. Stop and check. Equally if the clicking is happening, but the ‘thing’ ain’t tight, it might be worth checking. Of course, this is not helpful advice for those of us that do not possess common sense. Park Tool (which I’ve only just realised doesn’t have an ‘s’ at the end of Tool) is the tool manufacturer of choice if you want to mimic a pro cycling team mechanic, you like the colour blue and you have lots of money. 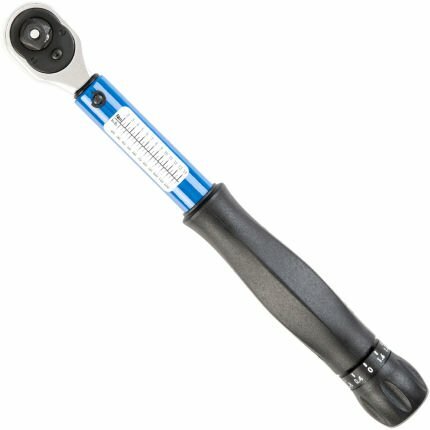 The TW-5.2 is a ‘small torque wrench’ with a range of 2-14Nm, adjustable in itsy bitsy 0.4Nm increments. It succeeds the TW-5, which had a slightly minimum torque setting of 3Nm (the brute!). The TW-5.2 comes in a (bright blue!) protective case, but doesn’t come with any attachments. It’s quite expensive, but sometimes you have to stump up the cash if you want to look like a pro. And this one is even more expensive. This is Park Tool’s ‘big torque wrench’, with a range of 10-60Nm, in increments of 0.25Nm (again succeeding a forerunner that could only go down to 12Nm). You’d use this one for messing around with (okay, tightening) your bottom bracket and cassette lock ring – that sort of heavy duty thing. Whilst, like its younger smaller sibling, the TW-6.2 also doesn’t come with a head/socket set, I’m sure that ownership would make me feel powerful and manly. Every little helps. For some mysterious reason*, this torque wrench set used to be sold as the Lifeline Essential Torque Wrench. Now it is under the X-Tools brand. No matter, it’s still a great choice. Adjustable between 2Nm – 24Nm. A selection of 10 bits (one of which is a longer reach attachment) makes this the most flexible toolset of the ones I’ve found. At the time of writing, there are 1,742 (count ’em!) 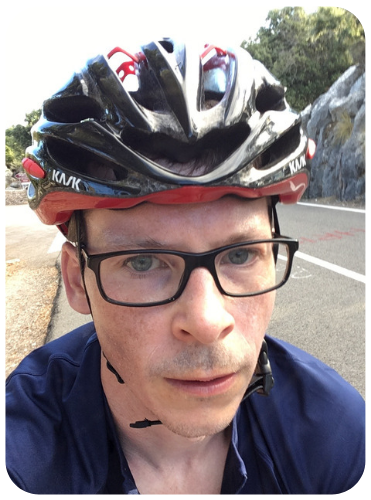 reviews on the Wiggle site, giving an average rating of 4.6 out of 5. With those stats (and the very reasonable price), it’s safe to say that this would be a solid choice. I can’t really work out why this one is twice the price of the ‘Essential’ torque wrench set from the same brand (this also used to be a Lifeline tool). Despite the price hike, the reduced torque range (3-15Nm) and the smaller set of heads, I found myself irrationally drawn to it. And, reader, I married him bought it. Which officially ranks me as an idiot. An idiot, though, with a well-made torque wrench in a nice protective case. A full review will follow, but in the meantime, I can confirm it has performed admirably in all the scenarios where my wrenching has required accurate torque-ing. 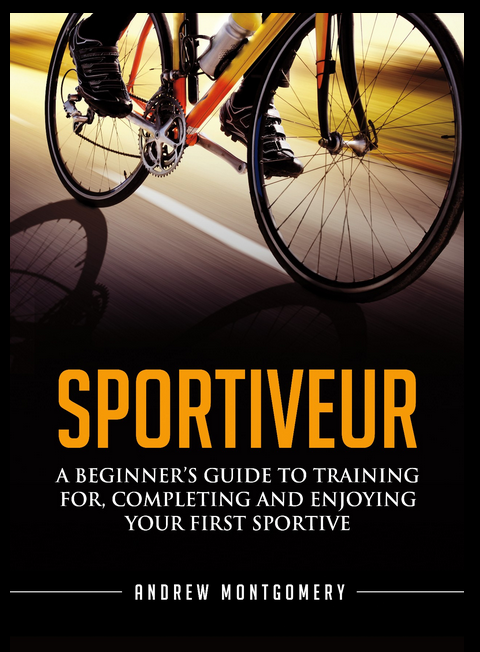 (And, for completeness, the ‘Pro’ version also scores 4.6 out of 5 from Wiggle customer reviews – albeit from 163 of them rather than a gazillion for the ‘Essential’ version). Another sensible choice. Nice little zippy case. Seven bits/heads (which must cover most, if not all, the potential use cases on bike). This looks like the cheapest option, considering it comes with 5 bits (4 hex/Allen; 1 Torx). It’s convenient too, in that the bits stay in the handle when not in use. It does look a bit plasticky to me, but the reviews on Amazon and elsewhere suggest that this isn’t a problem in use. I suppose I’m saying that I think it looks a bit …. ugly (whisper it). From the cheapest adjustable torque wrench to one of the most expensive. But this one is digital and seems to involve a battery. It makes a warning sound when you hit your desired torque setting. I’m featuring this one because I like the name. I think it’s a strange mix of Italian and Spanish, which (with the help of Google Translate) may or may not mean: “Effect Butterfly Right Force 2”. It’s pretty clear I’ll get more use out of a little torque wrench than a big one. So that’s an easy first decision. I don’t feel the need to pay a premium price to get the Park Tool version of the smaller wrench. My cycling tool kit (such as it is) is already a mix of manufacturers. It isn’t all classy blue. So I think it’s between one of the Lifeline options (probably the ‘Essential’ version cos I’m trying to be sensible) or the BBB Torque Wrench set. Before I make the plunge though, does anyone already own a torque wrench that they would recommend? Let me know in the comments, and I might take your advice on board. Canyon give a little beam style torque wrench away for free. All you have to do is buy a bike. As it happens I have just bought a torque wrench, the Lifeline Essential one above, as it was affordable and came with good reviews as you said. I got it mainly as have recently bought some carbon handlebars and didn’t want to over tighten them. The wrench seems good quality with all the useful attachments and so far has been working great. Like you mentioned I think a smaller capacity torque wrench is more important to own than a larger one hence my purchase. Matt, you posted while I was typing. Maybe you can tell us how you find the setting window in use? Do you find it easy to tell exactly what you’ve set it to? Have a close look at the way you adjust the settings on these models. On the Lifeline Professional and BBB, you can see you wind it to increments of 3Nm in the window, then add on the smaller divisions by rotating the cap at the base of the handle. In use, I’ve found this gives a level of confidence that you’ve set the tool correctly. I’ve not used the Lifeline Essential, but it doesn’t appear to have the same sort of setting mechanism, it only looks to have the window. I might be missing something, but that doesn’t look as good to me. The two Lifeline and the BBB appear to be generic, rebranded types. Nothing wrong with that (I have one myself, same as the Lifeline Pro but cost £20 more – what did I do there??? ), but if you have a search, which you clearly have done, you will find the same torque spanners with different branding (see what I did there?). I’d avoid the very cheap ones like that Topeak Combo. This isn’t the “click at setting” type, if you look. There’s a needle on a calibrated scale. As you tighten the bolt, the wrench bends and the needle moves up the scale. They work, but you won’t feel like a pro, and where’s the fun in that. So if it were me, I’d choose between the BBB and the Lifeline Pro…. As a retired aircraft engineer, I know only too well the need for, and value of, applying the correct torque to mechanical fasteners (bolts,clamps etc.). 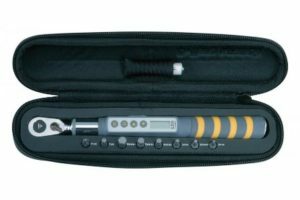 I have the Essential Lifeline Torque Wrench and it’s a really useful, well made piece of kit and for the price, great value. It suits most of the needs for bike component reassembly. I thoroughly recommend it. Thanks for the articles. Always useful and sometimes grin inducing. I have the Jobsworth one from Planet X, looks identical to the Lifeline essential but knowing PX might be priced slightly cheaper and has been in their many sales in the past. Seems ok, but I have nothing to compare it to. Functionally it’s easy to use and as the required accessories for both my road and mountain bikes. Overall I’m happy with it. I’ve had a Topeak D-Torq DX for 2 years and could not manage without it. Very expensive (£148 at Evans). Excellent range of 4 to 80 Nm. It comes with a good range of hex/allen/torque sockets too. Very quick and simple to use. Additionally, when removing an item it lets you know the torque that the item was originally set at. 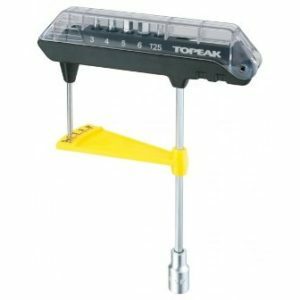 I use the Topeak Combo Torque Wrench and had no problems with it at all, I did think it looked a bit weak because of all the plastic,but up to now it has served me well. For the price I paid i am impressed with it.Easy to read and use. I own a 5 N-m Bontrager torque KEY. Good for most bolts and can carry in a pocket on a ride. Also the Park TW-5 for saddle and steer tube tightening. Recommend both. Being a similarly frugal Yorkshireman I went for the Topeak Combo. I’ve been tightening things for years using the principle of hand tight then another quarter turn, and maybe sometimes a hammer for good measure. Having bought a carbon framed bike with other seemingly fragile bits I thought I’d better be a bit more scientific so I bought the Topeak on price. £15 from ebay and so long as the calibration can be trusted it does the job. So far nothing’s broken and nothing’s fallen off so I guess it’s ok.
I’d definitely also recommend the need for good quality attachments (the hex bits) that you need if you buy say the Park Tool TW5 (which I have). I got crap ones from B&Q and then inserted one into my Park Tool, connected that to my Dogma seat post and…hey presto…it completely sheared the hex bolt, destroyed the nut and the seatpost was rendered useless. And, yes, before anyone says, I had used a lower recommended Torque setting than that stated on the seat post by Pinarello…..a rather embarrassing trip to the LBS then ensued where they drilled out the seat post clamp. Anyway, point is spend money on decent attachments as its money well spent. In fact, I’ve been more than happy with the cheap-o torque attachment that came with my Canyon – works absolutely fine. 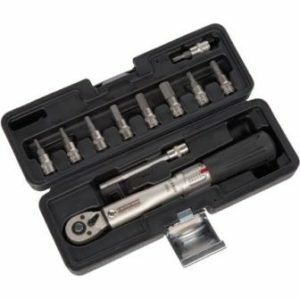 I’d be giving Teng tools a look (for instance http://www.screwfix.com/p/teng-tools-drive-torque-wrench/44700#product_additional_details_container) purely because I know they are well made (my 1.4 drive socket set has been my go to for two decades plus now) they do the range you appear to be looking for and come with a 99 year guarantee. For some reason, probably the same as your professional leaning, I’d avoid a more bike specific tool. An interesting article about something that had never have occured to me until I bought a carbon framed bike and heard all the dire warnings about over tightening bolts. I opted for the ‘Lifeline Professional’ (I’m not sure I was aware of the ‘Essential’ at the time), have used it a great deal and have been very pleased with it. I did also buy a small extension bar (about 3 inches long), which makes accessing some of those awkward to get at bolts a little easier to deal with. In addition, while I ‘hear what you say’ about bike-specific wrenches, because this bike-specific item is rated up to 15Nm only, I also bought a non-bike-specific (are you still with me?) 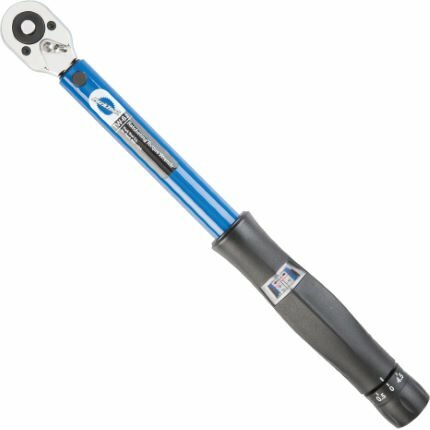 Draper torque wrench (model 3004A, I think), which has a 3/8 inch drive and can handle settings up to 80Nm. This is useful for those bigger jobs – cassettes, bottom brackets, and the like. I can also recommend this item. Thanks for this tip. It is spelled Norbar, and it gets great reviews on Amazon. Ordering one now! 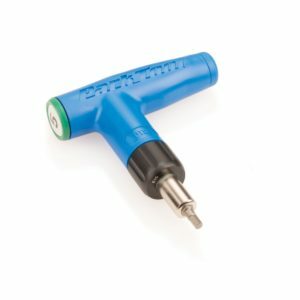 Are TOPEAK Nano Torqbar preset wrenches any good?